Use this page to create new events, or modify existing events in the calendar. Events are the things that happen, associated with one or more dates. They appear on the calendar for visitors to see and interact with, as well as search for. Adding an Item using a product template. Use the Event Options tool bar to add additional information to your events. By using the Event Options tool bar you can add: Categories, Locations, Contact information, Images, attachments, and Items for sale or Registration. Click an icon to add this type of information to your event. Use the Event Options Accordions to add additional information to your events. These accordions correlate to the Event Options tool bar, allowing you to add: Categories, Locations, Contact information, Images, attachments, and Items for sale or Registration. Click an accordion to add this type of information to your event. The shortest description of an event is its name. The name of your event will appear by default on all calendar views when visitors are looking for events on your site. Event Publisher requires that every event has a name and allows for up to 100 characters in this field. The primary information area for your event. In this area you will provide all of the basic information about your event. Basic information includes: an event summary with the option to add a full description with rich text formatting, the schedule for your event, and the time zone of the event. Once you have provided a name for your event this area also contains the URL assigned to your event. This area also is used to determine if the event should be private or highlighted. You must supply at least a summary and date to create an event. The short description of the event, up to 250 characters. Quickly introduces your event, appearing on select calendar views. Use this space to grab the attention of persons browsing your site, to entice them to click on the event, to see the event’s full details. By default, if you select this box, the system copies the current text in the summary into a Full Description area. This area is not limited to 250 characters, so you can more fully describe your event. The full description supports formatting, like bullet points, numbered lists, and hyperlinks. Additionally, the full description area allows for HTML format. The description does not show on all views of the calendar site. It only shows on the event details page, when a site visitor clicks the event name or the event details icon. Provide information about the date and time of your event here. In this area you can create a repeating pattern or schedule for events that occur on more then one day, or provide the start and end date for events that only occur on a single day. Additionally this area allows for you to denote events as All Day events, for your events that do not have a set start and end time. A start date, end date, and time zone, are required. The other date and time fields are optional. All Day: Select this option if the event lasts all 24 hours in the date range specified. You can also select this option if the event does not have a set start and end time. This event repeats: Select this option to specify how often the event recurs (daily, weekly, monthly, etc.). If you select a recurrence option that requires it, an additional area opens for you to further specify the recurrence parameters. Do not show end date/time: Select this option to display only the start date and start time of an event. An end date and end time are still required to publish the event. This ensures the event will properly download and be displayed in personal calendars (such as Google Calendar and Microsoft Outlook) as well as in Event Sharing. Select the time zone in which your event occurs. Events in Event Publisher take place in a single time zone and each event requires that a time zone is assigned to it. Your site administrator has set the default value for the time zone for your events. In this drop down field you can select the appropriate time zone for your event. Your event is identified in your calendar by a unique URL appended to the web address of your calendar site. By default, the URL is http://go.activecalendar.com/yourdomain/event/event-name. You can change the appended event-id in the URL of your event, but only valid URL values are accepted. Also, you cannot change the domain of the URL; only the value that appears after the last slash (shown as event-id). Selecting the Make this event private option hides the event from the general public. Prominently feature events on the top of your calendar. All events become part of the calendar site, and are arranged by default in ascending date-and-time order. Selecting the option to highlight the event will predominantly display the event on the top of th event list. Highlighted Events must occur within the next 30 calendar days to be displayed. Highlighted Event must have an image to be displayed. By default, the next 4 Highlighted events will be displayed. Publish Date/Time: Specify a date and time which the event will begin to be displayed on the Calendar. Please note: an event must be approved prior to being visible to visitors on the Calendar. Unpublish Date/Time: Specify a date and time which the event will no longer be displayed on the Calendar. When using this feature the following three configurations are supported. Specify a Publish Date and Publish Time Only. Specify an Unpublish Date and Unpublish Time Only. Both a Publish and Unpublish Date and Publish and Unpublish Time. Classify your events to make them easy to find. Accessed by clicking the "Categories" image in the Event Options Toolbar this area allows you to specify values to make your events easier to find when a visitor searches your calendar site. This option consists of two content areas: Keywords and Categorization. Group similar events together using Categories. This makes them easier to find when searching and sharing. Categorization supports assigning predefined category values to your events. These values are created and maintained by the administrator in the site settings page. You can assign as many, few, or no categories to your event. Categories are best used for grouping similar events, such as placing all alumni events under an alumni event category, or all student life events under the category , “Student Life”. Only Selected Categories with a checkbox will be added to the event. Clicking the name of the Category will toggle the checkbox (checked or unchecked). When enabled, any color codes added to a category will be displayed to the left of the Category Name. Assign tags to your events here. This makes them easier to find when searching and sharing. Keywords help users search for events, and are useful for grouping together related events that do not share the same categorization structure (see Categorization). For example, you can use the keyword “Summer” to link together events like the opening of the community pool, the ice cream truck schedule, and summer play dates. Where does your event take place? Select from a list of locations, or type a location name here. Accessed by clicking the "Locations" image in the Event Options Toolbar this area allows you to specify locations to make your events easier to find when a visitor searches your calendar site. Specify where your event is occurring, depending on your license you can choose from a list of locations, type the name and address for the location, or both. You can assign one or more locations to your event. We recommend selecting only the lowest-level location for your event in the tree structure, to avoid confusion. For example, if your location structure is Bethlehem > Active Data Exchange > Conference Room. You should select only Conference Room. You can provide the name and address of an event location in this area. The name and address that you specify will be displayed with the event, and users will be able to click a link to view the address in Google Maps. Please note, free text or Ad-hoc locations will not appear in the location search drop-down. Add: Clicking this button will assign the text entered in the text box to the event's location. Search: Clicking search will verify that the name and address entered in the text box is not already a selectable option in the list of locations. If a matching location is found, you will be able to use that location by clicking the "Add Selected" button. If no matching locations are found, you can use the location specified in the text box by clicking the "Add" button. Clear: Clicking Clear will remove the text entered in text box. You can select from a list of pre-set locations in this area. Locations in this area will be displayed on the Event Details page, with a map (if enabled). Additionally locations selected form this area will be searchable from the location search drop-down. Only Selected Locations with a checkbox will be added to the event. Clicking the name of the location will toggle the checkbox (checked or unchecked). Double Clicking the name of a location will display sub-locations, any location with the ► symbol contain sub-locations. Who should be contacted with questions regarding the event? Accessed by clicking the "Contact" image in the Event Options Toolbar this area allows you to specify values for who to contact for your event. This information is publicly displayed for each event. The name of the person to contact for this event. The phone number of the person to contact for this event. You can specify the extension in the field below. This field is not limited to only numbers, so you could put 555-Calendars if you choose. The extension number of the person to contact for this event. This field is limited to only numbers, and only allows for 5 digits. The email address of the person to contact for this event. Clicking on the contact email will open your default email client and allow you to compose a message to that person. Accessed by clicking the "Images" image in the Event Options Toolbar this area allows you to upload images to your events to make them more enticing to a visitor of your calendar site. You can upload a maximum of 5 images, that are up to 3mb each, per event. Please note that some of the sharing functionality of Event Publisher requires that your image be at least 300 x 300 pixels large. It is recommended that you upload the highest quality images available so image quality is maintained for visitors of your calendar site. Browse... Click to open a file locator window, from which you can add one or more images to your event. Upload: Click this link after selecting an image to attach to your event. Images you have chosen display below the Image box. Select the check box in an image's top left corner to designate it as “primary.” Your primary image is displayed first on your calendar page. Primary Image Checkbox: Located at the top left of an uploaded image selecting this check box sets an image as the primary image. A Primary image is the image used in the default listing of events, and is more prominently featured when a site visitor clicks on your event to see the details. NOTE: Even if your event only uses one image, you must select this checkbox. It is required for at least one image per event. Alternate Text: Each image has a label of up to 100 characters that displays when moused over. It is also used by visually impaired web browser assistance applications for WCAG conformance. By default, this text is the file’s name, but in most cases you can choose a better name for it. If you keep the file name, it’s best to remove the file extension (.jpg, .gif, or .png). (Delete image) Click the red X to remove that image from the event. A list of images will be displayed, click the "Select" link to the left of the image you wish to use. Accessed by clicking the "Attachments" image in the Event Options Toolbar this area allows you to upload attachments to your events to include additional information or files to a visitor of your calendar site. Attachments are limited in two ways. Events can have a maximum quantity of 5 attachments that total up to 10mb per event. For example, you could upload 5x 2MB attachments, 3x 3.3mb attachments, or any combination that does not exceed the quantity (5) or size (10mb) limit. Browse... Click to open a file locator window, from which you can add one or more Attachments to your event. Upload: Click this link after selecting a file. Files you have uploaded display below the Attachment box. Display Text: Each file has a label up to 100 characters long that displays as a link. By default, this text is the file’s name, but you can change it to something better. If you do keep the file name, it’s best to remove the file's extension (.doc, .xlsx, .pdf, etc.). (Delete attachment) Click the red X to remove that image from the event. A list of files will be displayed, click the "Select" link to the left of the file name you wish to use. Accessed by clicking the "Products" image in the Event Options Toolbar this area allows you to add Registration and Sale Items to your events. Products can be used to sell tickets, merchandise, or even free registration for events. Users can register to attend or purchase items for your events in one of two ways. Each option has its unique benefits, which are highlighted in the sections below. Click the add Registration Button. Click the add Sale Item Button. Click the add registration button. Registration is best used to offer tickets, packages, or individual registrations to your event. Registration will automatically require the collection of first name, last name, and email address for reporting purposes. Additionally, selecting a product type of registrant will allow you to designate an item as a "primary registration". When using the “Email Registrants” feature, you will be able to email persons who have purchased registration items. Registrants can be managed and marked as “Attended” via an event’s dashboard. Lastly, all purchases made for this items will be listed as Total Registrants, and Space Available Tiles on an event’s dashboard. Reporting on these items is accessed via the “Registrants” report. Enable Ticketing: Select this option if you would like to include a ticket with this registration. Tickets include a QR code that can be scanned on a mobile device to permit entrance into an event, and to track attendance. Name: provide the name of the item to be displayed to the public. They will see this name when viewing the event. Item Name is required. Description: Up to 1,000 characters for elaborating on the specifics of an item. This field is best used to include information regarding what is included with the item. For example, a ticket might include admission, a program, and seating at a specific section of the arena. Cost: Provide the Cost associated with this item. This field will automatically populate with the text, "free". For a free registration, you can skip this field. Collected after Fees: Setting a cost for your item will require the collection of service fees. The dollar amount that will be collected (less any fees charged by your payment gateway) is displayed here. Quantity available: Specify here the number of this item available, such as seats in an auditorium for a concert event, or branded t-shirts. This field will automatically populate if your select a payment type of donation. Potential Earnings: Setting a cost for your item will require the collection of service fees. The total dollar amount that could be earned if your event sells out this item (less any fees charged by your payment gateway) is displayed here. Donation: Choose this check box if you would like to allow the purchaser to specify the cost of the item. Check-out prompts for payment. Visitors to your calendar site will be able to pay online via a credit or debit card. Use this link to view additional options for this item. The show more options link allows you to specify what information you would like to collect from the registrant, sales dates, and enabling the waitlist. Collect information when a person registers or purchases an item. Questions: Here you choose which information a purchaser or registrant is prompted to supply when registering for the event, or purchasing the item. Select the box beside a field, and the purchaser can supply that information; click the Required box to the right of a field, and the purchaser must supply it to continue with the purchase. After adding a question, you have the option to edit your question by clicking the "Edit" link to the right of the required checkbox. The next section describes the question collection settings. In this area, you are able to create a custom questions specific to this item. You will create the information that a purchaser or registrant is prompted to supply when registering for the event, or purchasing the item. When creating the question you will need to supply a Display Name and Type. What Information do you need to collect? :The text in this field will be displayed as a question when an item added to the cart. For example, if you need to collect the registrants highest level of education completed enter: Highest level of education completed. Please note, this field is limited to a total number of 50 characters. Response Type: This drop down menu controls how (and in certain cases what) information is collected. Visitors will be prompted for this information when a item is added to the cart. You can only select one option from the list of available types, each of the available options is described below. Text: Selecting this product field type will allow the visitor to type a text input in response to the information requested by the product field. This type is best suited when the response(s) that will be generated will vary greatly and predefined responses may not be appropriate. Yes/No: Selecting this product field type will present the visitor with a check box that they can check to indicate a "yes" or "no" response. It is important to note that this field is presented to the visitor as a single check box, not two separate yes or no check boxes. Therefore, it is important that you phrase your "Display Name" in a manner that will encourage the visitor select the checkbox for a "yes" response and leave the checkbox blank for a "no" response. This type is best suited when the response that will be generated should be limited to a predefined group of acceptable values and the visitor is only intended to select one item from the list of options. This type is best suited when the response that will be generated should be limited to a predefined group of acceptable values and the visitor should be able to select more than one item from the list of options. Allow this question to be available for all products for this event: Selecting this checkbox will allow the event creator to collect a response for this question for more than one item (Regisration or Product) that has been added to an event. Save: Selecting this link will add the question to your event. Visitors will be prompted to answer the question when they add this item to the cart. For example, you might want tickets go on sale 10 days before the event, but stop being sold online 2 hours before the event start time. Start Selling: Enter starting time, as measured from the start of the event, when the item is available for purchase. Stop Selling: Enter an ending time, as measured from the start of the event, when the item is no longer available for purchase. Cancellation Deadline: Enter a time, as measured from the start of the event, when the item can no longer be cancelled by the registrant. Please note, administrators are still able to cancel a registration or purchase after this deadline. Quantities. : Here you set minimum and maximum required purchase amounts per item, per transaction. Minimum per purchase: A minimum requires the users to add no fewer than that quantity of an item in the cart. Maximum per purchase: A maximum requires the user to add no more than that quantity of an item in the cart. The user can purchase up to the maximum quantity (leave blank to not impose an upper limit). 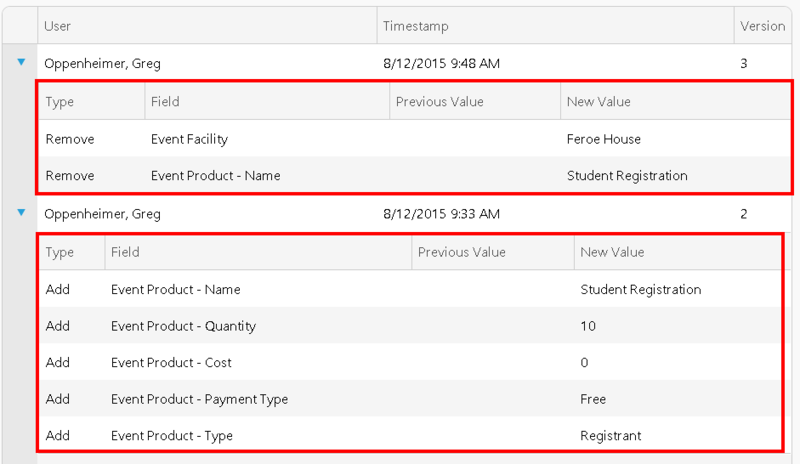 Use the advanced tab to enable the waitlist for this item, specify an item category, or share question information. Use Waitlist: allows for collection of information of persons who would like to add a currently sold out item to the cart.When an item is sold out, the add to cart icon will be replaced with an icon that reads, "Join Waitlist". Waitlist will collect the following information when a person joins the waitlist. You can access the waitlist in the reporting section of the application. Click Here to navigate to reports. Item Category: Select what category this item belongs to. Visit Site Settings -> Product Setup to create item categories for your reporting. Share Question Information: asks the purchaser at checkout to provide the information once for the item, for the full quantity of that item purchased. In this case, a five-ticket purchase results in a request for only one first name and last name, to apply to all five tickets. Please note, this option applies to each available item. 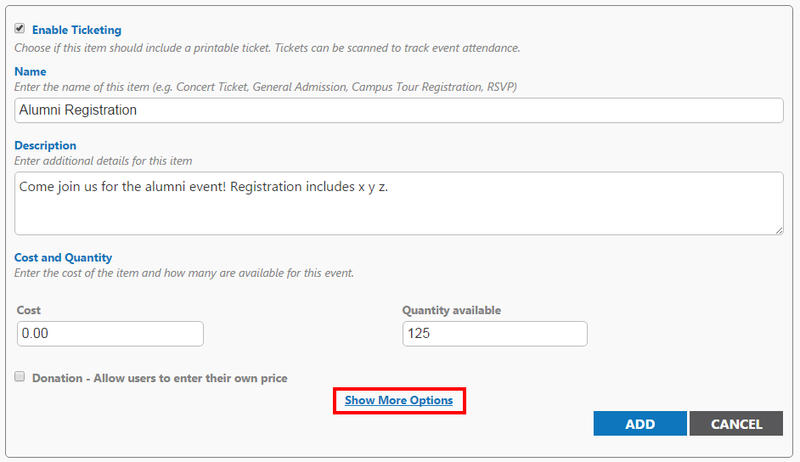 Meaning if your event is configured to have a student ticket and an alumni ticket, you are able to select this option independently for each ticket type. Meaning, your alumni tickets could share question information, while your student tickets can be configured to collect information for each individual registration. Primary registration notes: The visitor it limited to selecting one primary registration item per visit. Visitors will select one from the drop down, provide the necessary information and complete the registration process. If an event is configured to have more than one primary registration item registering for more than one primary registration item will require the user to visit the registration page more than once. Sale item: does not require the collection of any information for an item purchase. Additionally Sale items are not included in the Total Registrants, and Space Available Tiles on an event’s dashboard. Reporting on these items are accessed via the “Sales” report. Sales items are recommended for tangible items, where tracking responses to item questions and attendance are not necessary. Questions: Here you choose which information a purchaser or registrant is prompted to supply when registering for the event, or purchasing the item. Select the box beside a field, and the purchaser can supply that information; click the Required box to the right of a field, and the purchaser must supply it to continue with the purchase. The next section describes the question collection settings. Share Question Information: asks the purchaser at checkout to provide the information once for the item, for the full quantity of that item purchased. In this case, a five-ticket purchase results in a request for only one first name and last name, to apply to all five tickets. Your system administrator can configure "pre-fabricated" products to offer with your events. These product templates can be configured with the following information. To add an item to an event using a product template. Select an Item from the "Product Template" Drop Down. Selecting this option will require that all information collection (things like quantity, type, etc.) are collected in a new browser tab or window. All of the items available for the event will be displayed on the new window. The only information that will be displayed on the event details page is an icon labeled "Register". Clicking on that icon will open the new window. You can configure an event to "pool" or link all products together to share quantity. For example, you may have a maximum capacity of 100 registrations, but you can sell any number of Student Registrations, Staff Registration, or Guest Registration, up to a total of 100. Click the "Registration products share quantity" option for your registration items to share quantity. Please note, only items added with a product type of "Registration" can share a maximum quantity. You can configure registration items to use an "express checkout" with the One Click Registration feature. When enabled, the person registering for the event will bypass the confirmation page. This allows for immediate registration from the event details or dedicated registration form. Please note, One Click Registration applies to all Items applied to an event with a product type of "Registrant". Additionally, if a user already has items in their shopping cart, one click registration will not be applied. The user will complete the normal checkout process, which includes a confirmation screen. If you would like to offer at the door sales, or like for a person to register for an event after it has started select this this check-box. Once checked, you will be able to accept registrations up until the end time configured for a particular event. This area only appears on sites where your calendar administrator has configured additional fields of information to collect for each event. Required fields are marked with an asterisk (*) symbol. These fields can be configured by your calendar administrator to be text boxes, multiple choice drop downs, as well as radio buttons. This area allows for authors and administrators to leave comments for an event, as well as view the history of changes made to the event. All comments that you input will be visible to the system administrator when they review your event. These comments will be stored to the event and visible in the change log regardlress of its status. Once the event has been saved or submitted the comments are saved to the change log. All comments you leave here are visible to all administrators. When a comment is added to an event the following information will be displayed. Within each version of an event changes will be organized into a table that provides the following information. Type: Listed as "Add" or "Remove" for the appropriate change(s) made to the event. Field: Lists the name of the item that was changed, for example "Event Name, "Event Location". Previous Value: Will display the last approved or saved value for a field. For example, if an event's name was changed from Music Festival, to Summer Festival the text, "Music Festival" would be displayed. New Value: Will display the changed value for a field. For example, if an event's name was changed from Music Festival, to Summer Festival the text, "Summer Festival" would be displayed. Does your event create a double booking or conflict with another event? This area only appears on sites with a premium license, and where your location administrator has selected to "Prevent Double Booking". When creating an event this area will remain hidden until you have selected a location. If the location that you have selected has a previously approved event occurring in the same date and time or overlapping dates and times the location conflict panel will display the following message: "There are scheduling conflicts for this event. The details of the scheduling conflict(s) are listed below. ".